I had a blast at the 29th Annual Women in Aviation International conference last week in Reno! It was a blast and for any woman who works in aviation it was a real treat to see over 3,000 airline pilots, military pilots, engineers, mechanics, controllers, and private pilots all come together to celebrate aviation. Over 124 countries were represented including a colorful group from Uganda. Of course, some of the topics were unique. This was the first time I’d seen a presentation on Flying While Pregnant, and a couple sessions on blending aviation careers and family. 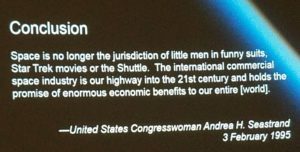 One of my favorite sessions was Aviation/Space Lawyer Michelle Hanlon who gave a very interesting lecture on why spaceports are important to the future of Aviation around the world. My work environment over the years has been primarily male, and though I have enjoyed their company (well, most of them anyway) I have a hard time describing how the atmosphere changes when surrounded by a group of like minded, intelligent and successful women. The only analogy I can think of was from a day when I was working at Albuquerque AFSS and there were actually three women on duty all assigned to positions near each other. A lone man was on one side of this trio with another 10 or so men scattered around the rest of the operations room. We laughed at the time, but the reality is each of us girls had spent thousands of hours as the only female in a room listening to casual conversations about cars, bars, and sports during the slack times between radio or pilot briefing calls. The percentage of women in aviation careers is finally improving. On the last day of the Reno event I was on a career day panel with 6 other women which opened a day of adventure for over 200 young women ages 10 to 17. I represented Air Traffic Control, there were also a private pilot who’d flown a small aircraft around the world, an airline pilot, a Boeing mechanic, an Osprey pilot, a university professor, and a stewardess. After the panel the girls went to special exhibit hall where several airlines, universities, and aviation corporations set up activities and demonstrations including flight simulators. The main exhibit hall featured representatives from all the big aviation companies and government entities just like any other aviation event – but this one had a few interesting differences. The National WASP WWII Museum both had one of the few remaining members of that daring squad of women pilots signing her recently published book. One other special moment occurred while I was registering at the event. The lady getting me checked in wore a badge identifying herself as a retired B747 pilot. She told me she used to do the Seattle to Anchorage run. I mentioned I’d ridden jump seat on a B747 on that run with a co-pilot who was pregnant in 1989. Her eyes popped open “That was Me!” We figured it had to be – there just weren’t that many women flying B747’s on that run in that year. What a treat! To any women reading this post, check out Women in Aviation International – it is truly a groundbreaking group of gals!